February 8. 1967. 2.30 at BH. The bloke from BBC Finance wearing a green tank top was getting bored with the endless discussion on item 18 of the agenda: ‘names’. 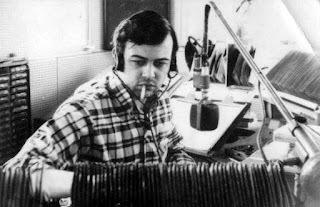 He stubbed out his cigarette and asked just how many radio stations needed names. ‘Four’ he was told. ‘Very well’, he slurred. ‘Radio 1, 2, 3.’ He coughed. ‘And 4’. And stormed out to get a new packet of Park Drive tipped. I made that up. But I often wonder how those names came about. I am guessing there was no brand research back then, despite the fact that the BBC had been researching its audience in various ways since 1936. You can just imagine a woman in a tweed skirt on the corner of Oxford Circus with a clipboard, asking people what the word ‘One’ meant to them. It’s amazing that now, in the context of radio, those three letters have been afforded such depth. And try now saying ‘Radio Four’ without making a meal of the latter word and sounding posh. That single syllable has come to denote decency and intellectual rigour. The new Radio One was originally to be named after its wavelength ‘Radio 247’; and maybe then the Light, Third and Home might have stayed as they were, rather than take digits. The Home Service? What’s that all about? No wonder nobody ever listened to that. Kiss is a great station name, isn’t it. Perfect. I wonder if anyone ever said it sounded like a love songs station. It would have made such a great name for that too. I can see the logo now. But hey, it’s worked well not playing Bill Medley and Jennifer Warnes. I was not in the meeting when they alighted on the name Magic (hardly surprising as I’ve never worked for its owners); but I’ll wager there were a few dissenters round the table. ‘We liked it’ - ‘Not a lot, but we liked it’. No, genuinely, it’s huge. I remember being sat on hard cushions in a Manchester Galaxy focus group, through one of those eerie two-way mirrors, where we spoke to a set of Galaxy listeners and a set of ‘heritage ILR’ listeners. Identifiable by what they wore. The way Galaxy was spoken of afforded it almost reverential status. Far more credible than “usual commercial radio”: Galaxy was the right thing to be listening to. Funny really. There were those at the outset who suggested the name was just a chocolate bar. And, I was often told the story in my Chrysalis days, that London’s Heart was very, very nearly named something quite different at launch; and not the same name as its established West Midlands sister. Phew. There was a worry that it might sound too much like a very soft love songs station. I was never 100% keen on the Century name; but when you walk into a station, you take the name for granted unless it causes specific worries. That could also have been a decent name for an older 50+ format, (or maybe a station targeting 100+ if we all carry on living the way we are). But the newly-launched brand became known for its great personality; and a few bus backs and its scale across the country saw to it that the name did a good job. In proud Scotland, it was clearly a decent idea to call a station ‘Scot FM’. But, despite its name, the station was not as speedy on its journey to success as its various owners might have wished. Perish the thought they could ever whip off that brand and dub it Real. I guess they are pretty chuffed at 61% audience growth since the change ten years ago. Research suggests that Birmingham did not relish a station called Capital. The name means London. How could they possibly use that in a City which turns its nose up at ‘bloody London’? Or, at least, that name meant London back in November 2010. Now, thanks to one, now two, truly excellent TV executions and a product which meets its audience needs well, there is no doubt that the name is as good as any other. And there is no doubt about the overall success, to date, of that brand rollout plan, however much we loved its predecessor stations (and Trent has a place in my heart the size of a Psion Wavefinder). There are clearly stations which have not done so well under new names too. At the end of the day, listeners are either encouraged to listen or not; and they enjoy the product or not. They decide. When you change a name though, their level of passion shines through. That’s a tribute to the incredibly close relationship a station enjoys with its listeners. We should be worried if there was no response. In radio, as in any industry, a brand is about more than just the letters which make its name. It’s quite possible to grow into a new name, and just as possible to grow out of an old one - often for a host of reasons which are all too prosaic. And I say that as the biggest anorak of them all. And, of course, Radio One could easily have been Radio Four. That feels so wrong.